The What: Magewell has unveiled the new Pro Convert AIO RX hardware-based NDI decoder, adding to its portfolio of devices for bridging traditional video equipment with IP-based workflows. The Pro Convert AIO RX will make its global debut in booth SU5724 at the 2019 NAB Show (April 8–11 in Las Vegas). 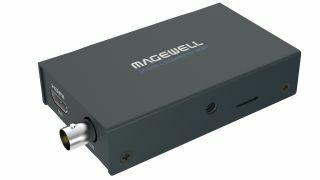 The What Else: Just as Magewell's Pro Convert encoders enable users to connect SDI or HDMI-based video sources such as cameras into flexible, IP-based production infrastructures, the Pro Convert AIO RX lets integrators and end-users output any NDI stream to baseband presentation or distribution equipment such as displays, projectors, and routers. It can also be used to integrate legacy equipment such as switchers into NDI-enabled production workflows, or simply paired with an NDI encoder to enable long-distance transport of audio, video, and power (PoE) over a single IP network cable. "The Pro Convert AIO RX helps customers maximize their investments in production, distribution, and display equipment as they transition to IP, but we also designed it to be a catalyst for accelerating the adoption of NDI in the professional AV market," said Nick Ma, CEO and CTO at Magewell. "It affordably opens the door for using NDI in video-enhanced digital signage; large-scale video walls; multi-site video distribution; image magnification (IMAG) in churches and entertainment venues; and other presentation applications. We are also pleased to add these powerful decoding capabilities to our popular Pro Convert Plus encoders, giving customers exceptional conversion flexibility." Slated for release in Q2, the Pro Convert AIO RX decodes NDI streams and outputs them over HDMI or SDI interfaces at resolutions up to 1080p HD. Users wishing to decode and output 4K NDI streams can do so with the newly upgraded Pro Convert HDMI 4K Plus or Pro Convert SDI 4K Plus encoder/decoder models. Owners of existing Pro Convert HDMI 4K Plus, Pro Convert SDI 4K Plus, Pro Convert HDMI Plus, and Pro Convert SDI Plus encoders can add decoding abilities with a simple firmware update. Once upgraded, the units can be switched between encoding and decoding modes through the browser-based interface, providing versatility for users with varying project- or event-based workflows. In decoding mode, the device's HDMI or SDI loop-through connection becomes the output interface, with the unit's input connection able to serve as a "hot backup" source if the chosen NDI stream is interrupted. The Bottom Line: Converting live NDI streams into high-quality SDI or HDMI outputs for connection to baseband devices such as monitors and projectors, the low-latency decoder simplifies the use of NewTek's media-over-IP technology in applications such as digital signage and video walls.